I’d like to start off by asking what seems like quite a simple question: What is the difference between data and information? And taking it a step further, where does knowledge fit into this definition? Not as easy to answer as you might expect, is it! Before we start getting our hands dirty creating some awesome data visualisations, it’s going to be useful to learn the definitions of – and difference between – these three words. Data is a set of unprocessed facts (the word comes from the latin datum which means “that which is given”). These data are generally meaningless until they have been processed. This could be a list of a population’s height, eye colour, skin tone, handedness, etc. Information is what you get after you’ve processed the data. This is much more useful and easy to process than data for humans. Continuing with the census theme, information includes the average height of different countries, that 1 in 10 people are left handed, and that Scandanavians tend to burn more easily in the sun. Knowledge is perhaps the most difficult to define, but the definition which I think makes most sense in this instance is how we use our past experiences to decide what to do based on information. If we know that we have a lighter skin tone, we go out and buy a higher SPF sun block before summer holidays. If we think about the weather (considering I’m English, it’d be rude not to mention it at least once), the data is the set of measurements recorded by the Met Office (temperature, pressure, satellite images of the clouds, etc), the information is the forecast which they produce (this is, the processed facts), and the knowledge is what you choose to do based on the information (i.e. wear shorts or take your umbrella out with you). Now that you know what data, information and knowledge are, you should be able to see that the purpose of data visualisation (or data-vis as the cool kids call it) is to take data and turn it into a more meaningful form – information. People can then use this information along with their knowledge to make decisions or draw conclusions. I’m sure that you see examples of this almost every day in the form of infographics, but data-vis is not limited to static graphics—some of the best visualisations I’ve seen are animated to show how trends change over time. It turns out that sometimes it is useful to play around with your data to find trends before even thinking about the design of your infographics or charts. It can be used as a tool as well as an end result. So what are we going to build, and what with? I’ll show you how to build a relatively simple interactive chart which will display various stats on roller coasters (those of you who know me will be rolling their eyes right now). It will be like one of those scatter graphs which you had to draw in maths at school with an X and a Y axis, but instead of using an ‘x’ or a dot for each point, I’ll use a circle which will change in size to allow for a third dimension. And just to show off, I’ll also colour the circles differently to indicate what kind of roller coaster it represents. A simple chart which can display four pieces of data per point. Pretty nifty, huh? It’s important to have a good dataset in order to get any meaningful information out of the visualisation, so if you’re serious about getting into this and want to play more after reading this article, I’d advise you to go out and either find an existing dataset or generate your own based on something which interests you. Luckily for me, there’s a website similar to IMDB but for roller coasters (rcdb.com) which is where I scraped my data from. If you’d prefer to use my data, you can download a copy. There are a number of tools out there to help you to create charts and visualisations. My favourites are Raphaël, Paper.js, and more recently, d3.js. Each has its benefits and drawbacks. 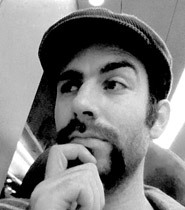 Raphaël for example has great support for our best friend IE, but it can be a little more involved in terms of writing the code. d3 doesn’t work in anything less than IE9, but it has a very simple chainable syntax and makes working with data incredibly easy. For that reason, I’ll be using d3 for this project. For each of these steps, you can change the appearance of the ‘node’ (data point), introduce delays and transitions, update other nodes, and more. It might be easier to understand with a simple example. Doesn’t sound too hard. Fancy taking a look at some code? Every time you come across something which feels like it should have been done before, you should take a look at the d3 API reference. You’ll find that most of the things you want to be able to do are already part of the library (or there’s a plugin for it). Parsing dates, loading and reading CSV files, code for chart layouts, and the ones which will help us out here: domain and range. maximum and minimum output values – i.e. the pixel values, which is called the range. The SVG in the demo is 200×200 so those are the values we’ll need. Except that the circles’ radii can be up to 20 pixels, so let’s shave those off and set the range to be 20—180. I’ve highlighted the bits which have changed in green in the code listing below. So the demo looks pretty cool, but to be honest, the animations could feel a little sexier. Simply having a visualisation which looks cool, has pretty colours and moves won’t necessarily make it any good or fun to play with. You can put all the time in the world into making it work, but if it doesn’t feel right, it can just feel, well, crap. You’ve probably heard of easing before – it’s what makes the animations feel different. There are loads of different easing equations to play with, and if you’re adventurous enough you can even create your own. One of my favourites is “exponential in and out” which means that the animation will start slowly, speed up, then slow down again at the end. All you need to do in d3 to use an easing equation is add it into the method chain. I won’t post the entire code listing again this time, just the bit which has changed. It’s a subtle change, and it’s sometimes difficult to pick which is best, but if you keep playing with them for long enough you’ll find the one which adds that extra 10% to how good your visualisation feels. (I also think it’s one of the most fun parts of building something like this.) Have a look at the visualisation with easing. If you’d like to know more about easing equations (or just want to play with them), check out this interactive demo. What we have is pretty awesome so far, it displays circles which represent some data, and we’ve got them animating nicely between the different values. But what are these values? The major thing that we’re missing from the visualisation is context. Let’s add in some axes. d3 has an axis function which can build an axis, label it, and add tick values (lines) in sensible locations based on the domain of a range function – like our xRange or yRange. You can style the parts of the axis with CSS too, which is pretty nifty. // any other setup information we might want to do. The following CSS will give you some nice looking minimal axes. Because the axes are getting their values from the range functions, if you update the domain of the range function, the scale can update itself too. Let’s give this a whirl by updating our code so that domain of our range functions is the set of values between the minimum in the dataset and the maximum in the dataset. That is, on each update, we’ll find the minimum value that the data has, and the maximum, and apply them to the range using the domain function, just like when we set them up. Adding the following to the update function will do just that. It’s a little vomit inducing (and probably a little confusing to look at and understand), but here’s a proof of concept. Believe it or not, we’re not far from the finished product now. There are data points which can be positioned at an (x,y) coordinate which automatically gets scaled to fit onto the graph. These data points are circles whose radii can be varied to visualise a third dimension of data. We have axes which we’re able to update and data points which we can animate between states simply by updating the data. All that we have left to do is to load in some real data, update the data points and axes, and add a couple of HTML form elements to use as controls to cause further updates (which is in the final demo). Are you ready to visualise some real data? I have collected 8 datasets which contain a number of details about roller coasters and stored them in csv files. 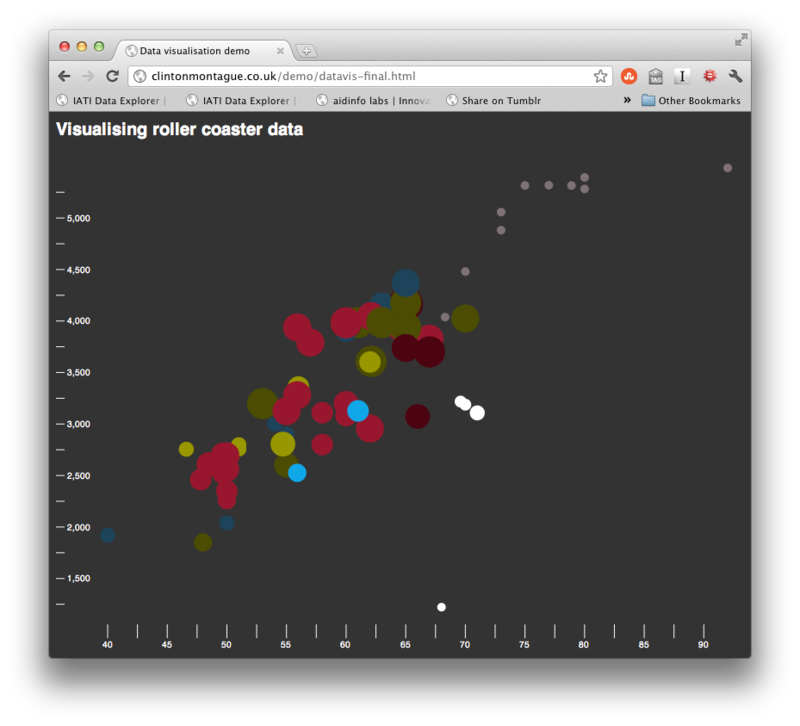 Each dataset represents one roller coaster manufacturing company. So each csv file contains a list of roller coasters built by an individual company. The roller coasters are split into further categories (or “types”) which are listed along with each roller coaster. Other interesting data in each row is the ride’s height, speed, length, duration, inversions (how many times it goes upside down), and the year that it opened. Some of this data is “dirty” which means it contains bad data values (for example, a length of zero feet). // let's kick it all off! Have a play and see if you can find anything interesting! All of the files used in this tutorial are available for download if you fancy having a go at playing around with its guts. I love this stuff! What next? What was it that you liked about reading this article? Was it the first part where we were playing with randomly generated data, or did you prefer taking real data, plotting it and finding interesting trends? If you liked playing around with shapes, colours & animations, and the data was just a way to make things move, you should check out Processing which is very similar to d3 but is used to create digital and generative art and lets you compile your creations into applications. You can even hook it up to an Arduino and create interactive art. If the data was more your thing, go out and grab yourself a dataset to play with! You can use my CSV files which are available in the demo files in the data directory if you’d prefer to dive straight in. Play around with different shapes and experiment with other ways to visualise the data: heatmaps, bar charts, on a map, you’re only limited by your imagination. Whatever you choose to do, I hope that this has either helped you get to grips with d3, inspired you to play with data, sparked an interest in making animations in the browser or simply kept you interested enough while reading it. If you make anything interesting, I’d love to hear about it! Tweet me – @iblamefish. Go forth and make cool stuff. Remember to post a link if you make anything cool! Thanks! Your code is easy to follow, love it. Great man, simply great! Straight and easy to understand ! Tks a lot ! awesome stuff sir, the final demo is simply too good. Excellent ! Thanks for doing this–d3’s documentation is limited to an API Ref, so a step-by-step guide for building a sophisticated data visualization is welcome indeed. I downloaded the source after following the tutorial; the source is an excellent template to continue learning this library. @doug I feel your pain! I felt the same when I was learning it, but could see how great it is so persevered. I’m glad that you found the code useful – and even better that you’re using it again and again to keep learning, it’s great fun! This was really helpful! There is a three step calling process to apply transition effects but I couldn’t find this anywhere else except this post. Every where the codes are written and explained but no one explained this way! Can any one give me any idea of how to load json data from a php file? I tried it with d3.json(somefile.php) and it worked in my pc but didn’t work in an online server. I also tried d3.text() but it didn’t work even in my pc. Awesome! I actually came across this while working on something similar (http://scattersit.herokuapp.com/), but this has more features and is far less vomit inducing than mine. Best D3 tutorial I have seen so far. This is very well explained. 4-component breakdown explanation was very helpful. Thanks. Thanks for the tutorial, it gives great insight into using D3 and how much it can do! I follow… What if I’d like to have pre-made SVGs (icons) instead of colored circles? Is that possible? Hello! edekefe interesting edekefe site! I’m really like it! Very, very edekefe good! Hello! geedeea interesting geedeea site! I’m really like it! Very, very geedeea good! The tutorial is well laid out. Thanks for your efforts. This was a great help. Is there a means of adding a colour legend to the actual plot? I’m thinking of modifying the code so that instead of using radio buttons to set the circle radius, they set the circle colour based on a particular variable. I’ve figured out how set the colours, but then I would like a legend on the graph which states what each colour represents. Thus if the radio button plots colours based on site and I have 5 sites, I would like to know which color corresponds to which site on the graph. But if I click a different radio button and set the color based on month, I would like the legend to update and show which color corresponds to which month. Is it possible to extend your example to include such a legend? So far I haven’t found any good examples of how to code such a legend. This tutorial is fantastic and is one of the most understandable and best commented I’ve found so far. It really put me on track with d3, finally! Any idea on why it can’t read it can’t read the id property, or why ‘d’ is null? Wonderful tutorial. Thanks a lot !!! How to include a slider to animate a trend in time for example? Any resource you can point me to? Hi, none of the links to the demo work? Thank you very much for your tutorial. It helps a lot. I have a question about downloading the files you used, both the csv and d3-related files. Somehow I run into the issue “404-page not found”? Would you mind sharing with me how I may troubleshoot it?